The Clinical Negligence Team have prepared an Infographic on key facts relating to Erb’s Palsy, the condition and its causes. Erb’s Palsy is a condition suffered as a result of damage to the brachial plexus nerve causing. Injury to the cervical nerves most often occurs during childbirth as a result of shoulder dystocia, where the nerves are stretched and damaged. Erb’s palsy can cause paralysis or weakness in the affected arm, causing the arm to hang by the side or cause problems in lifting or rotating the arm. The condition can range from mild to severe but will usually, in all its forms, cause difficulties for those who suffer from the condition. 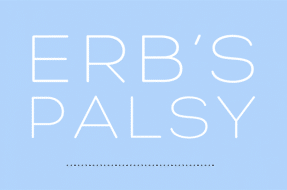 The clinical negligence team are proud to support the Erb’s Palsy Group which is the only UK based organisation offering advice, information and support to families affected by Erb’s Palsy.